Home Model Trains	HO Scale CSX Model Train Compilation! 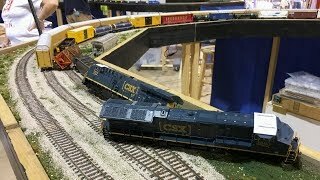 HO Scale CSX Model Train Compilation! Coverage from the East Coast HO Exhibitors Society model train display at Harvest Festival in Miami, FL. We run many versions of local CSX freight trains, and end up with a fair share of separations and derailments. A lot of what we ran had train car counts so long they push the limits of the ScaleTrains motors and also what we are allowed to pull on the layout lol. But nonetheless enjoy! Happy Thanksgiving and thanks for 7000 subs!